I'm a noodley girl through and through. If given a choice between rice or noodles for dinner in my Asian household, the fave choice is always noodles. Soupy, saucey, dry, hot, cold, egg, flat, whatever, I love noodles of all varieties. Last weekend whilst waiting for Hubster Lee to come home, I made a quick peanutty soba noodle lunch to accompany some leftover fish we had to heat up to eat. You can eat this entirely on its own and vary up the toppings...perhaps a bit of fried tofu or thinly sliced carrot? Add a bit of meat with some leftover shredded roast chicken? Shredded roast duck? Thinly sliced egg omelette? The options are endless! For the sauce, you only need a dessert spoon and a bowl (or jug) and a few household ingredients. As you can tell I'm still living on a Japanese food high, hence my reach out for noodles of the Soba variety. 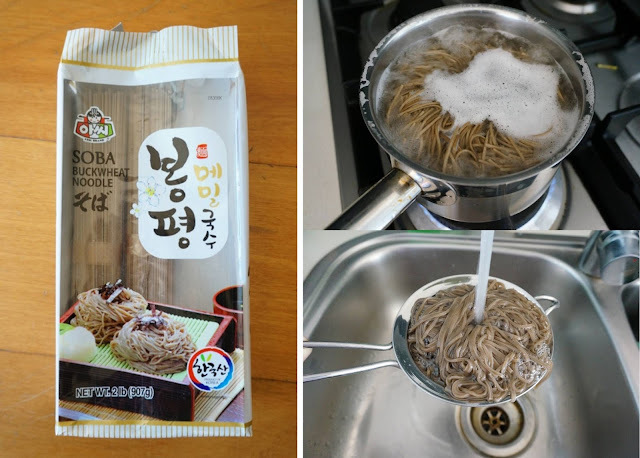 The brand I used however was a Korean brand and you can find good Soba noodles in the international aisle of the supermarket or just your local Asian supermarket. I haven't tried this with Almond butter or other 'healthier' nut butters yet, but I'm sure this will work just as well with those. 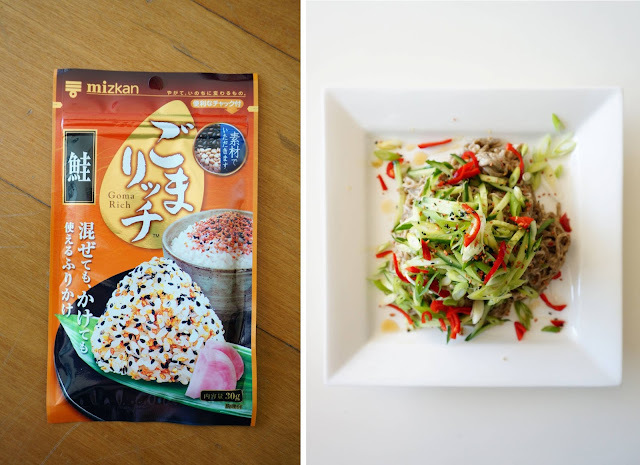 Super cheap, and super quick meal to whip up. Seriously! Pour the peanutty sauce over your bowl of Soba and using tongs, toss the sauce through. 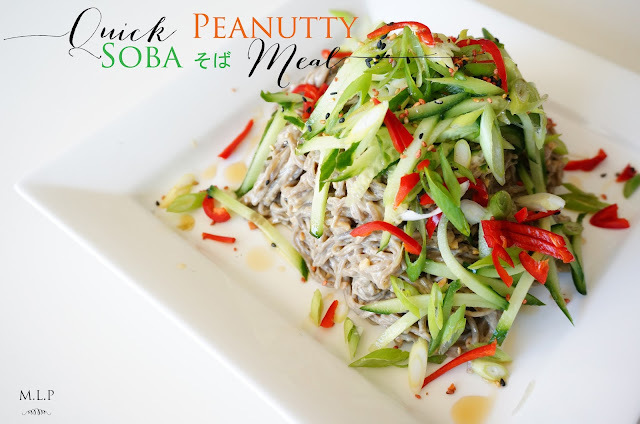 Place the peanutty noodles on a large plate and top with the cucumber, chilli, green onion and then sprinkle the toasted sesame seeds / Japanese Goma mix on top. I used to love chilli SO MUCH as a teenager but over the years, my taste buds have gotten a lot wussier and therefore my tolerance is kinda average. So having the cucumber on top of the chilli is a great mix of cool against the heat. Note, this plate of noodles is served cold, so it's perfect for the warmer months. But it's pretty versatile in that you can eat the noodles warm as well.